- The audio industry standard Texas Instruments XI02221 FireWire 800 chipset is ideal for audio professionals because it offers low latency and high bandwidth, reducing audio glitches and drop outs. - Large amounts of redundant storage. Support for up to four storage drives, RAID 0/1/5/10 and 4 TB of SATA 6 Gb/s storage, ideal for those with large amounts of data. - High performance desktop processors and Intel X79 Chipset, LGA 2011 socket. Driving the system is a complete line of 6 core and 8 core Intel Xeon and Intel Core i7 Processors based on the LGA 2011 processor socket for serious processing power to mix vast multitracked sessions or heavy users of samples. - Multiple I/O ports to connect to a variety of specialized equipment. o 3x USB 3.0 ports allow for high speed data connectivity. o High definition audio interfaces. The EUROCOM Panther 4.0 comes with S/PDIF audio output, FireWire 800. 	S/PDIF is a digital audio interconnect standard based on the professional AES3 standard, it can carry two channels of PCM audio or multi channel surround sound. 	FireWire 800 is a high bandwidth, low latency isynchronous and asynchronous data delivery interface, ideal for audio, video and graphics transfer. o High definition video interfaces. 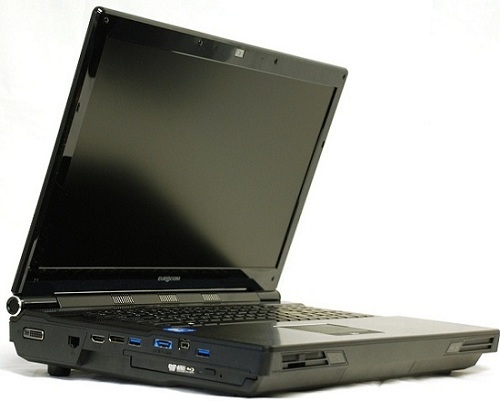 The EUROCOM Panther 4.0 comes equipped with HDMI 1.4a, Display Port 1.2, DVI-I. 	HDMI 1.4a is a high quality audio and video interface ideal for transferring uncompressed audio and video from the computer system to digital devices. 	Display Port 1.2 is generally used to connect a video source, being the computer to a display device but can also be used to transmit audio. 	DVI-I is a digital and analog interface designed to transmit uncompressed video. - Optional Solid State Drives for quiet operation. The EUROCOM Panther 4.0 offers optional Solid State storage Drives, because they do not have any movable parts, they offer perfectly silent operation. - Built in display, keyboard, track pad. The EUROCOM Panther 4.0 is built upon a high quality workstation chassis with a built in display, keyboard and track pad for easy transportation during on the go deployment.